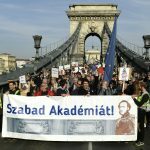 The internationally celebrated Budapest Festival Orchestra staged a musical demonstration in downtown Budapest on Saturday to protest against the Municipal Assembly’s decision to reduce funding for the ensemble. 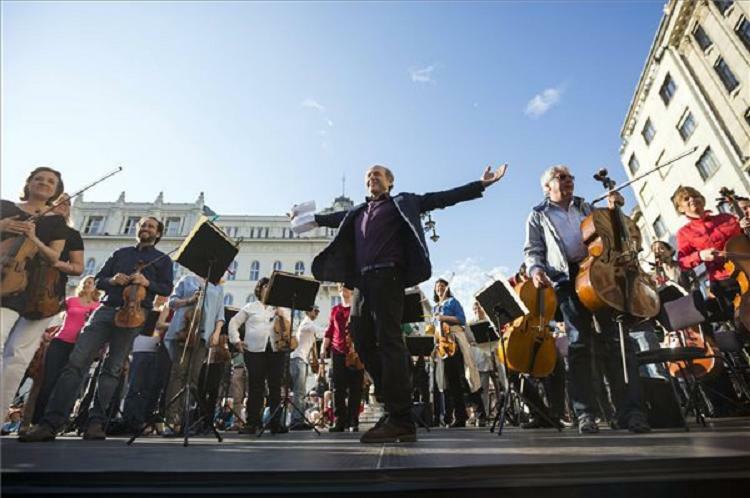 “First and foremost, we are here to demonstrate that we really love Budapest and we know that Budapest, too, really loves the Budapest Festival Orchestra,” Iván Fischer, the director, told a crowd that filled Vörösmarty Square. Fischer said he wanted to talk not about the past, but the future and what it is like to love Budapest. “We want a Budapest that has more music, more happiness, more love and less hate.” He spoke out for minority groups and said the orchestra wants them to feel just as safe as anyone else in Budapest, in a friendly environment filled with music. As a message to the Municipal Assembly, German Bass-Baritone Hanno Müller-Brachmann and the orchestra performed the aria from Mozart’s “The Magic Flute” in which Sarastro says that revenge has no place in his domain. At the end of April, the assembly voted to cut funding for the orchestra by 200 million forints (EUR 940,000) to 60 million. Fischer vowed that the orchestra would not fail Budapest and would continue to perform. 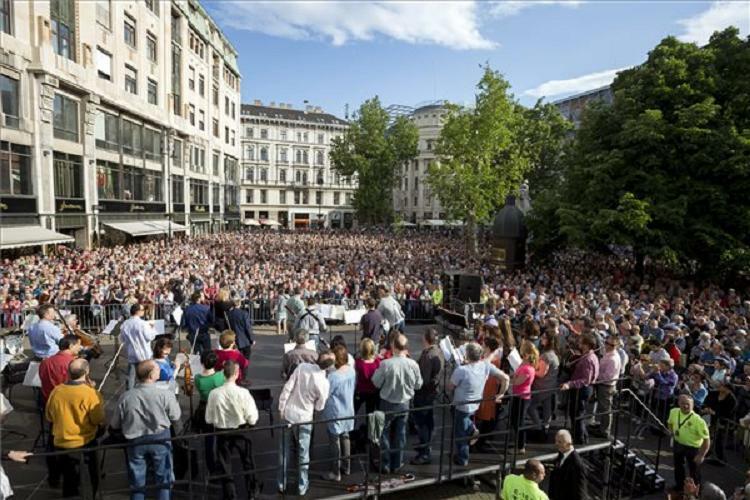 At the end of the demonstration, members of the crowd joined the orchestra with their own instruments in performing a Beethoven composition. 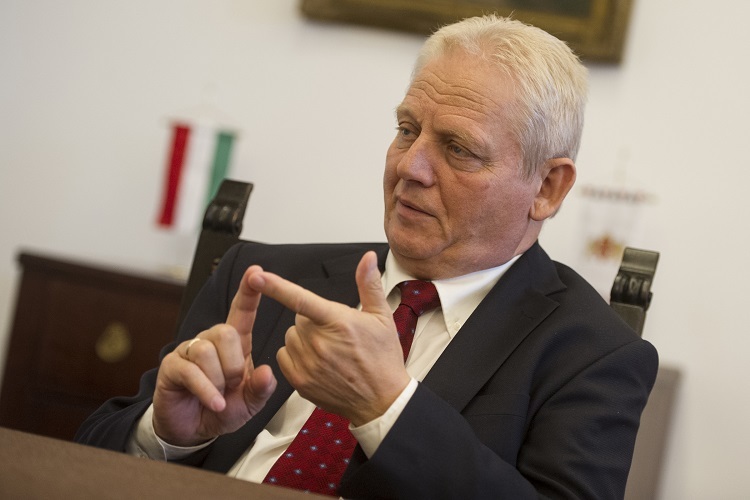 In the “debate” the lord mayor of Budapest István Tarlós pointed to some unkown details such as the council will in the future continue to support. The Budapest city council will in the future continue to support the Budapest Festival Orchestra to the extent that its budget permits, Budapest Mayor István Tarlós said. Last month, the Municipal Assembly voted to cut funding for the orchestra by 200 million forints (EUR 940,000) to 60 million Tarlós also said. Tarlós said that he and his cultural advisor had fought hard to secure the funds for the orchestra and revealed that some councillors were of the opinion that the capital should not provide any funding at all. The mayor said the situation around the orchestra had been made to look as if the city council had defaulted on an obligation by cutting funding. 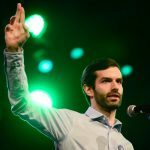 This is not the case, Tarlós said, pointing out that the capital is not legally obligated to provide any funding for the Budapest Festival Orchestra. He said that if the orchestra were truly in a difficult financial position, it would not be recording hundreds of millions of forints in annual profits and would not have over one billion forints in investments. Tarlós stated it was not true that the city council never notified the orchestra that their funding would potentially be reduced this year. 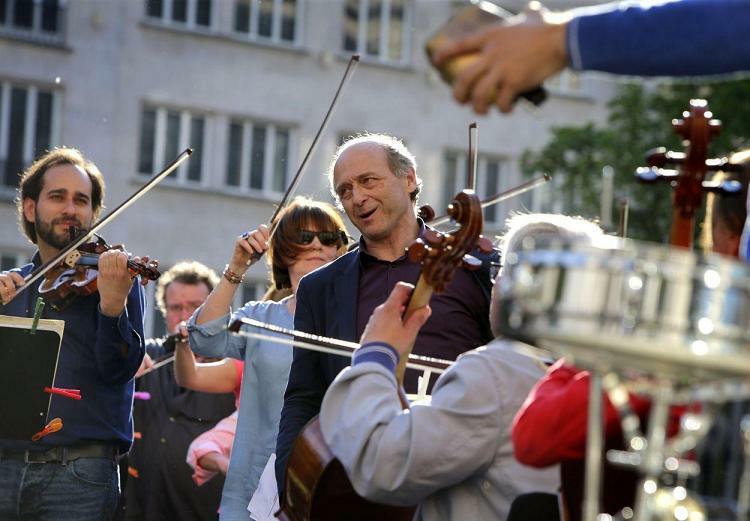 Tarlós said he had met the orchestra’s director Iván Fischer in February to tell him that there would be “problems” with the funding. The mayor said he had reassured Fischer that he would do what he could to ensure that the orchestra was given money. Last month, the Budapest Festival Orchestra issued a statement expressing shock over the planned cut. They insisted no discussions had been held on the matter with the city’s leadership and indicated that the cut would result in a cancellation of concerts. They said that they had agreed with the human resources ministry on an extension to the orchestra’s 1.15 billion forint government grant and said it was unacceptable that the capital would cut its funding without the two sides having held any talks about the matter.